The applied workshops are preceded by a related Summer School activity (10-21 July 2017) that will focus on growing competence in accessing, analyzing, visualizing, and publishing data. It is open to participants from all disciplines and/or background from the sciences to humanities. 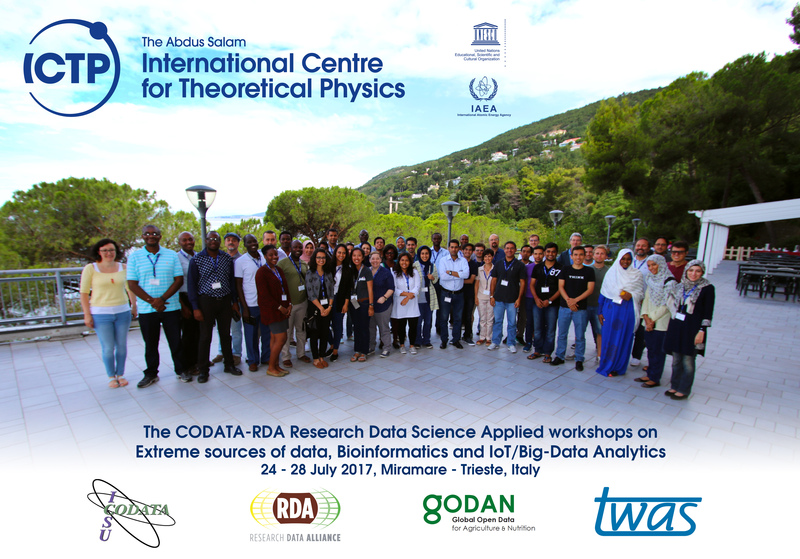 The three applied workshops (24-28 July 2017) focus on Extreme sources of data; Bioinformatics; IoT/Big Data Analytics. • Summer School: principles and practice of Open Science; research data management and curation; use of a range of research compute infrastructures; large scale analysis, statistics, visualisation and modeling techniques; automation and scripting. • Workshop on Extreme sources of data: Introduction to ATLAS Open Data Platforms/Tools , tutorials and CERN LHC. • Workshop on Bioinformatics: computational methods for the management and analysis of genomic and sequencing data. • Workshop on IoT/Big Data Analytics: Big Data tools and technology; real time event processing; low latency query; analizing social media and customer sentiment.